The wear and tear of our clothing is not caused by wearing them, but by washing them in washing machines instead. Many of my tennis shirts which I have been wearing for more than a decade have faded in color here and there and the fabric has thinned out over time. Still, I have no problem wearing these shirts on the tennis courts. 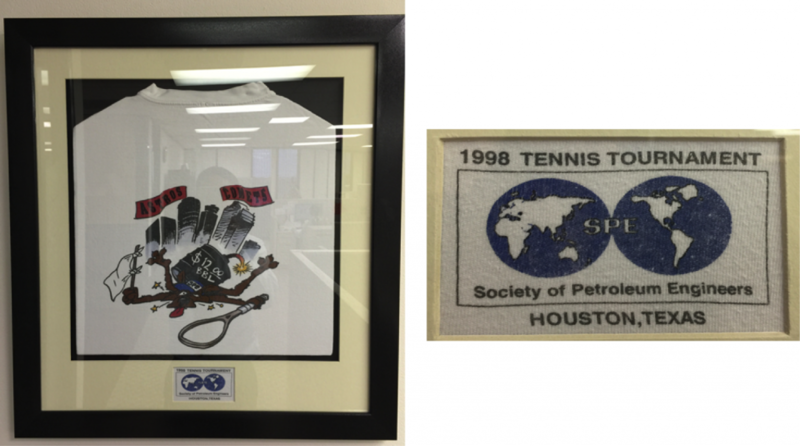 Every fall, the SPE Gulf Coast Section (GCS) holds an annual tennis tournament where they give out t-shirts to every registered player. I have been an active participant of this event and have collected close to 20 shirts over the years. The designs have varied in some way, but have maintained the same style, a cartoon on the back depicting the theme of the year. Among these t-shirts is the one I got from the tennis tournament held in 1998. Every time I see this shirt, I cannot help but let out a long sigh. Last month, I decided that this particular T-shirt should be treated as a relic, a piece of history that should be hung up in a museum. So I got it framed and hung it up on our office wall. That year, I was a mechanical/software engineer with Maurer Engineering, developing drilling software for DEA-44 (Drilling Engineer Association’s horizontal drilling joint-industry project). $12/bbl must have been the lowest oil price in 1998 right before SPE held their tennis tournament on October of that year. I don’t recall SPE ever making a T-shirt showing the record high oil price in the 2000s. Every time I wear this 1998 shirt to play tennis, my friends and I get a good laugh from it since most of them are involved with the industry and have all been a part of the oil-price roller coaster ride. The heydays of the drilling industry have helped us grow, and we have survived (or at least try to do so) in an era like the one we’re living through now. In early 2015 I told my team members that the low oil price was an opportunity for us to shift our focus to development. Now, being already the 3rd quarter of 2016, we are still stumbling on the downturn. But then again, who in this industry isn’t? Robert Louis Stevenson once said, “Judge each day not by the harvest you reap, but by the seeds you plant.” This is probably not our time for reaping, but for planting seeds instead. I used to carry this oil price on my back, but now I have placed it on the wall, knowing that some things are bound to be out of my control. I do my best within my means, and I have to make peace with those things I have no control over. On May 11, 2012, while I was shopping at Wal-Mart, I did a quick price check on different common liquids that most of us will buy, and compare them with the price of crude oil. 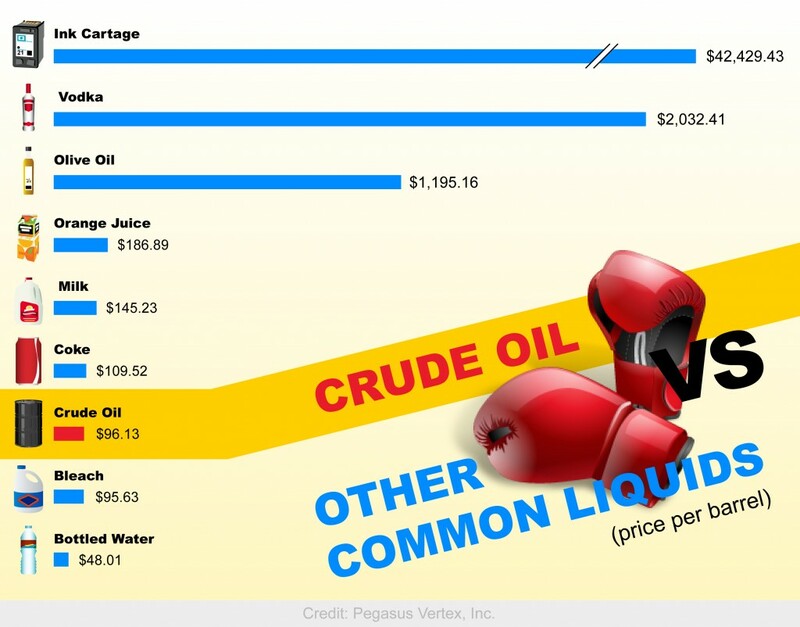 Below is the graph that shows the price comparison between crude oil and other common liquids in barrel.